Formed in 1985 and based in Irvine, California, HCP, Inc (NYSE:HCP) is an independent hybrid REIT (real estate investment trust). The company invests primarily in properties serving the healthcare industry in the United States, including sectors such as senior housing, life science, medical office, hospital and skilled nursing. HCP acquires, develops, leases, manages and disposes of healthcare real estate and provides financing to healthcare providers. 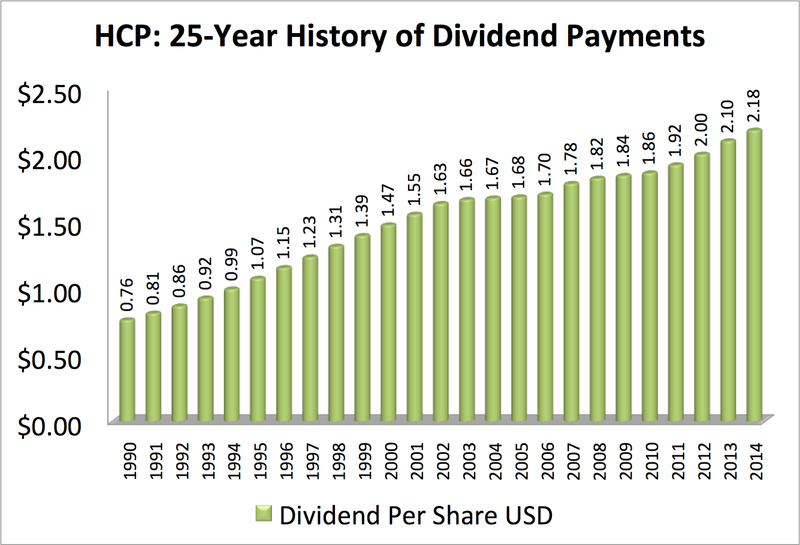 HCP is a Dividend Champion with an impressive track record of 30 consecutive years of dividend increases. The company pays quarterly dividends of 56.5¢ per share in the months of February, May, August and November. 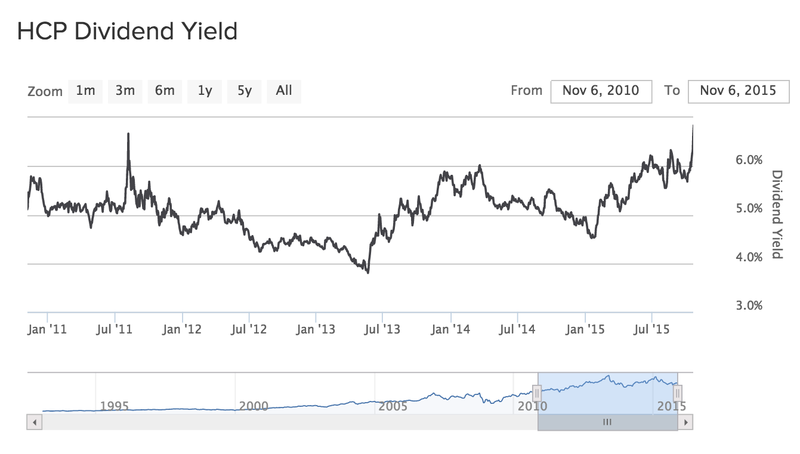 My buy price of $34.00 results in an initial yield on cost (YoC) of 6.65%. Adding 75 shares of HCP increases DivGro's projected annual dividend income by $169.50 to a total of $6,850. The company's 10-year price history is shown in the following chart, along with my buy price. The stock outperformed the S&P 500 by more than 50% through May 2013. Since then, the stock has lost ground, dropping about 38% from its all time high closing price of $55.28 on 21 May 2013. Overall, HCP has underperformed the S&P 500 by nearly 50% in the last decade. 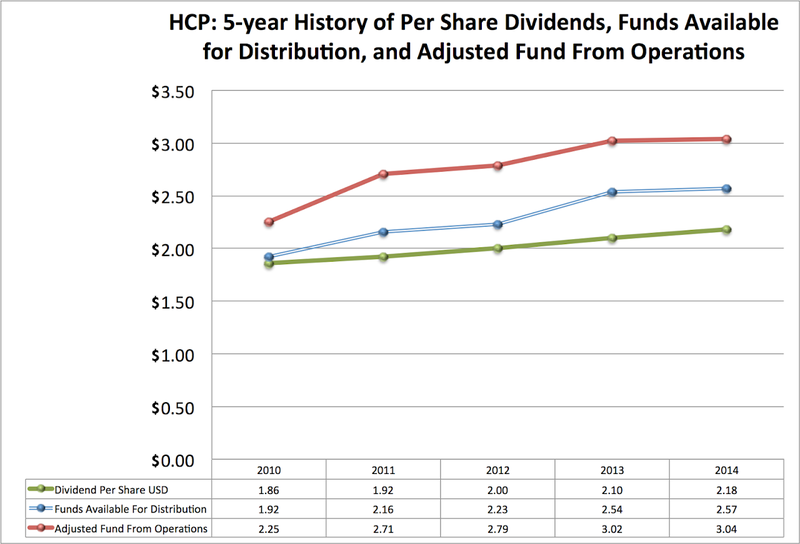 Of course, HCP is a dividend paying stock, so the picture looks much better if we include dividends. According to longrundata.com, an investment in HCP 10 years ago would have returned 8.94% on an annualized basis. 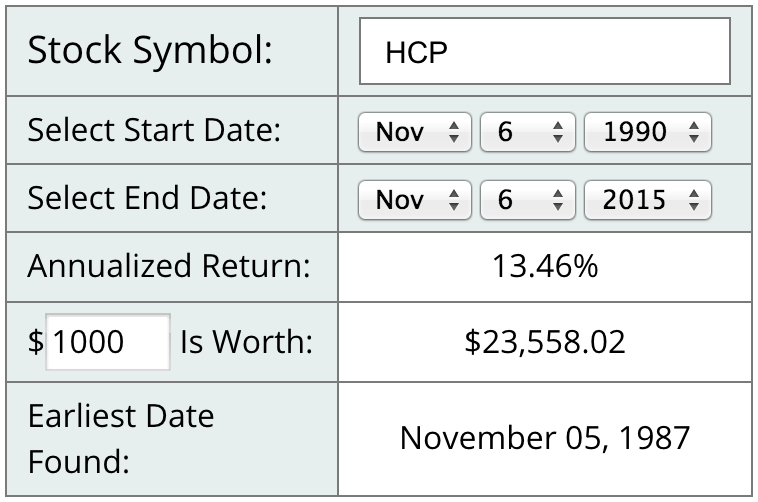 An investment of $1,000 in HCP 25 years ago would be worth $23,558 now, for an annualized return of 13.46%. The most recent dividend ratio (Dividend/AFFO) is 71.75%, which is a little high but still acceptable. Given HCP current annual dividend of $2.62, we can use a dividend discount model (DDM) analysis to determine the fair value per share. DDM analysis is a variation of discounted cash flow analysis with dividends and dividend growth rate substituting for cash flow and growth rate. 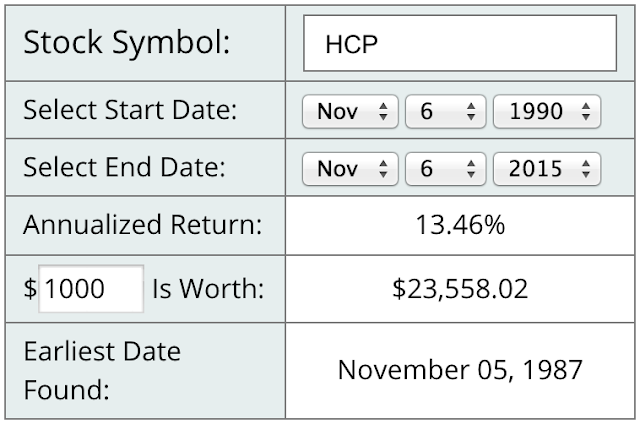 Using a 9% discount rate, expected dividend growth at 3.5% for 3 years and 3% per year thereafter, HCP's fair value is $45.96 per share. 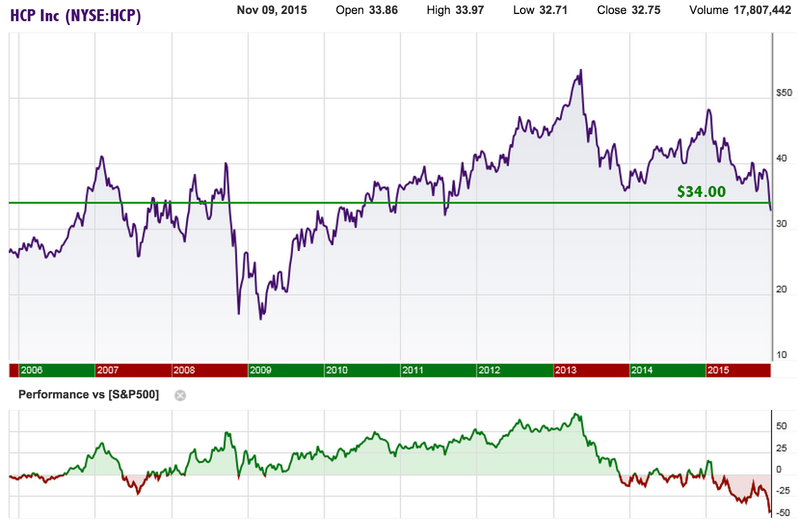 For comparison, Morningstar's fair value is $53 and S&P Capital IQ has a 12-month target price of $43. My buy price of $34 implies a discount to fair value of at least 25%. The following table provides some key statistics for HCP, with highlighted values relating to my selection criteria. Data sources include the CCC spreadsheet, Finviz, and Gurufocus. HCP is attractive for more reasons that its high yield and impressive dividend track record. Standard and Poor's Rating Services recently affirmed its BBB+ corporate credit rating on HCP, stating that "HCP's financial risk is characterized by strong debt coverage measures and relatively low leverage". Furthermore, the company will continue to benefit from favorable trends as an aging population requires housing and skilled nursing. Census figures indicate that more than 20% of US residents will be over the age of 65 by 2030, which is a potential major tailwind for HCP. HCP's fundamentals are improving, too. On 2 November, HCP announced results for Q3-2015. Adjusted FFO increased by 5% to 79¢ compared to the year-ago quarter. The company increased full year per share guidance for adjusted FFO to $3.12-$3.18 per share. One risk is continued uncertainty over HCR ManorCare, HCP's largest tenant, and its financial difficulties following legal issues. The troubled tenant accounts for about 32% of HCP's net operating income. Also, as is the case with most REITs, HCP's share price is sensitive to interest rate changes. Other risks include the likelihood of health-care inflation and increased regulation of the health care industry, which could adversely impact HCP's tenants and their ability to afford rent. Brad Thomas of iREIT Investor considers HCP a strong buy with a relatively safe dividend, although he believes Ventas Inc (NYSE:VTR) is the best healthcare REIT to buy right now. Other bloggers that recently bought shares of HCP include Dividend Diplomats, Dividend Hawk, My Dividend Pipeline, and American Dividend Dream.